Our Capilene® Midweight fabric hits the sweet spot of weight, breathability and wicking that, worn alone or with additional layers, is the essence of versatility. It keeps you dry and comfortable when worn during high-exertion activities in cool-to-moderate temperatures and insulates beneath a shell in cold weather. 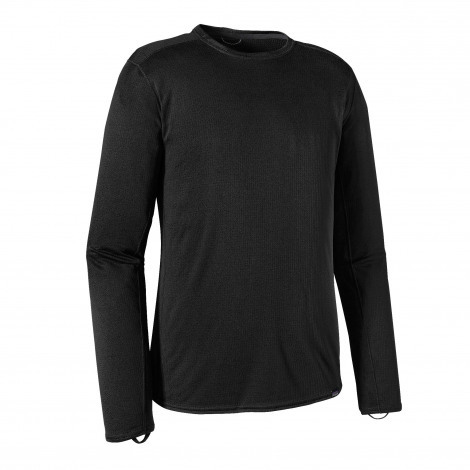 Constructed with a Polartec® Power Grid™ fabric, it has a smooth face for easy layering and a brushed-back grid that aids in wicking as well as warmth. The fabric has 63-93% recycled-polyester content and is treated with Polygiene® permanent odor control. Features include a rib-knit collar with internal neck tape for chafe-free comfort, full underarm gussets for unhindered shoulder mobility, elastic thumb loops for secure hand coverage, flatlock seams to minimize chafing, offset shoulder and side seams to lie smoothly beneath pack straps, and a drop tail for additional coverage.